After a poor start to the season by Arsenal – losing 2-0 to West Ham at the Emirates – last weekend’s victory at Selhurst Park can be seen as a major confidence boost for the side and fans. In comparison to Liverpool, the latter have had a more positive start. Two wins, two goals and two clean sheets. Compared to last season, so far Liverpool have been impressive defensively but limited in attack. Key players were missing for both sides as Arsenal were without Per Mertesacker and Lorent Koscielny while Liverpool were missing Jordan Henderson due to a foot injury he suffered in the 1-0 win over Bournemouth. From the line ups, it was clear that the front six for Arsenal may be the best they have at their disposal. They all have good technical ability and are tactically smart enough to play in Wenger’s fluent attacking system. In order to create space, the ball movement has to be fast, as well as the movement from those contributing to the attack. One way Arsenal created this space was by keeping the ball on one side of the pitch – the left. The movement by the front three and width from the left back allowed them to stretch Liverpool’s midfield and defence, enabling them to play penetrating passes into the box or switch to Bellerin who was holding the width on the other side of the pitch. The image that follows emphasises the amount of players Arsenal contribute to the left hand side of the pitch. Six players have contributed to dominating the ball on the left hand side of the pitch. Coquelin has provided depth to enable the switch, Monreal is providing width to move the Liverpool defensive and midfield lines if he receives the ball, and Ramsey has moved more centrally to support a direct ball into Giroud’s feet. Liverpool’s structure is effective here, causing Arsenal to switch the ball at a slow pace. Coquelin receives the ball and releases it to Chambers. Chambers who has stepped up with the ball now has two options: 1. Ramsey who already moved centrally to support any direct ball to Giroud is now in the right sided ‘pocket’, 2. Switch the ball to Bellerin who will be in a 1vs1 situation depending on how early the pass is from Chambers. He decided to switch the ball to Bellerin. However, if he was aware of Ramsey’s movement and position, a forward pass could have been made, allowing Ramsey to move the ball out wide to Bellerin. Bellerin’s run forward would have had to be timed if Ramsey plays a first time pass. The pass from Chambers was slow, causing Coutinho to put immediate pressure on Bellerin as he received the ball. Support from Ramsey is also slow. 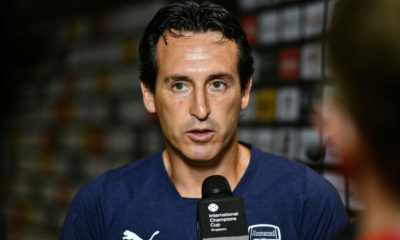 It is possible that if Arsenal had a better ball playing central defender available, they may have got in behind Liverpool’s defensive line with the afore mentioned combination. 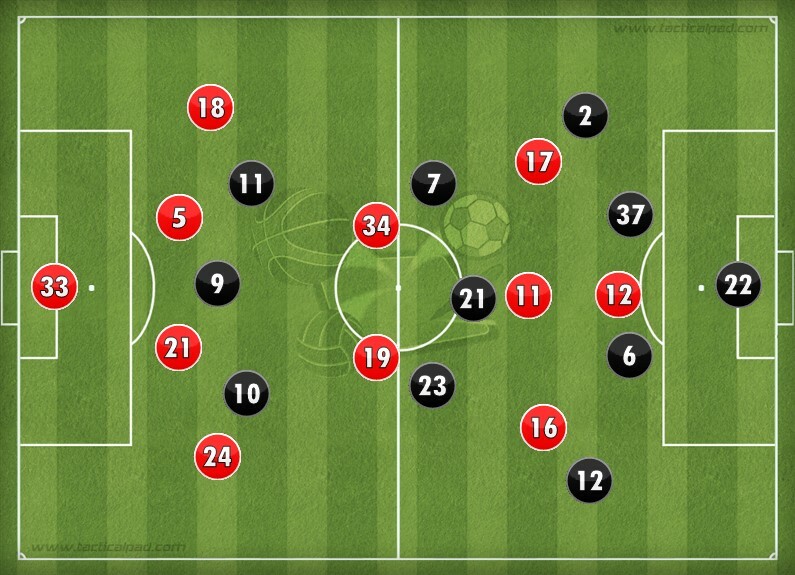 Once again, from the image above we can see how dominant Arsenal aim to be on the left hand side of the pitch. Rotational movement within this method of attack is important in order to gain the opportunity to play a penetrating pass. Giroud has dropped deep allowing Sanchez to become the striker and Ramsey has roamed into the left side of the three position. Ramsey has been circled a different colour as he is an important figure in this attack. Further on, the ball has been moved inside again to Cazorla to be switched or played forward. Compared to the last situation, Cazorla uses his accurate range of passing to play a perfectly timed through ball to the Welsh midfielder. Ramsey has done particularly well to find space and time his run to receive the ball at the correct moment. The space to pass the ball forward only became available due to the constant movement of Arsenal’s players and the speed of the ball – causing Liverpool’s defensive and midfield lines to be stretched. However, in this situation, Liverpool could have prevented the disallowed goal altogether. Milner has to move five yards more central (where the blue circle is) and the forward pass would have been prevented – causing Cazorla to switch the ball to Bellerin. Teams playing the 4-2-3-1 formation allow the front three behind the striker to roam with freedom in the attacking third. This was apparent in Arsenal’s game. Against Liverpool, Ramsey was on the right, Ozil played as the ‘No.10’ and Sanchez was positioned on the left. However, as the game went on and Arsenal got into the game more (second half), the trio didn’t have a disciplined and rigid role – instead they had the option to express themselves around the box and in between the lines of the opposition. Pictured above is one example of the movement by the front three. Ramsey – who is seen as more of a central player – has moved inside the pitch to help dominate in the central area. This has caused Ozil to move slightly to the right of the three. Ramsey has moved fast and receives the ball in between the lines of Liverpool, and with Sanchez on the left, if his decision making was a bit sharper a chance may have materialised. Sanchez has moved inside the pitch also (once again helping in dominating the central area), but it has also created the space for Monreal to start his overlapping run if nothing develops through the middle of the pitch. Keep a note of the time in this image – 07:35. As mentioned previously, although Ramsey was on the team sheet as the right sided player of the front three, it was clear early in the game that he had the responsibility to roam. His movement has attracted more midfielders forward creating that space for Sanchez to move inside between the lines. As well as allowing the other members of the three to move inside the pitch, if one of them drops so far back, it creates a three in midfield (pictured above: Coquelin, Ramsey, Cazorla). Having high numbers in this area of the pitch is key to dominating the ball and moving it forward quickly. Seven seconds later Ramsey has moved into the left sided pocket. In such a short space of time, Ramsey has moved from the centre circle of the pitch to the left half-space. At the moment, Lucas has control over him, but the movement of Sanchez and Ozil have caused the structure of Liverpool’s midfield to become slightly detached – as we can see from Sanchez’s position. Another ten seconds on, Ramsey has appeared in the box and had a goal wrongly disallowed – although some would beg to differ. This opportunity has been presented to Arsenal from using their attacking principles effectively. Ramsey has moved from the right hand side position and into the middle of the pitch. While the possession was maintained down the left hand side, Ramsey got in behind Liverpool’s defensive line to create a goal scoring opportunity. For many years, Arsenal have been a side who appreciate playing the ball out from the back along the ground – and they have been particularly good at it. However, with a changed defensive line it proved to be a difficult task. Firstly Arsenal being so deep, invites Liverpool to press high up the pitch. Milner has followed up his previous press on Coquelin to Gabriel whose body position is to play into the middle of the pitch. Benteke identifies this and is ready to press Chambers, along with Coutinho and Bellerin respectively. For this to be prevented, Gabriel has to realise Benteke’s position in relation to where the ball will be next. The young Spaniard can play a simple pass to Cech who can play a direct ball forward, causing the defensive line to tighten quickly. Arsenal’s ability to find a midfield player in this situation is poor. They’ve lined up in a U shape which is hardly conducive to playing the ball out from the back. As a result of this and good pressure by Liverpool it will be difficult to get the ball higher up the pitch. From the image above, it is clear that Bellerin’s body position and position on the pitch is poor. As Chambers takes his first touch he should be getting to the sideline as quickly as possible with his body primed to play forward or into the middle of the pitch. However, he is narrow and his body position isn’t appropriate to receive the ball before being pressed. As the game moves on, Coutinho’s pressure and Bellerin’s poor position before receiving the ball has caused the right back to lose possession of the ball. Arsenal’s ability to play the ball out from the back was proven weaker in the following images. Once again, Bellerin is too narrow and his body shape isn’t appropriate to receive the ball to play centrally. Also, there is no support from either Coquelin or Cazorla to bring the ball out. Chambers attempts to pass to Coquelin – who is out of picture – but Coutinho is preventing the passing lane accordingly. As mentioned previously, if Bellerin is standing on the sideline with his body open he can receive and play forward and if one of the CM’s drops low the ball can be moved centrally. Due to the poor awareness of the Arsenal back line and midfielders, Coutinho wins the ball and almost creates a goal scoring chance – only to be prevented from doing so by a last ditch tackle by the missing Coquelin. Above is a clearer picture of the situation. Bellerin’s poor position is emphasised much more in this picture. He’s not facing inside the pitch and isn’t wide enough. The blue circle is where he should be situated. If so, Chambers can easily receive the ball and play further up the pitch free from pressure depending on how fast the pass was from the centre- half. Liverpool’s new striker has given them the option of another playing style. Compared to the past two seasons, due to the Belgian’s size and strength, the five time European champions can have a more direct style of play to break down the opposition. During the game, Liverpool had phases of the game when they were in control and used Benteke as a target man, and when they didn’t have the ball, they used Benteke as an outlet pass. When playing a direct approach to the target man, support from the midfield has to arrive quickly in order for a goal scoring chance to be created. We can see from the image how quickly Coutinho is to get into the box to get on the end of a cut back by Benteke. Coutinho made good contact with the pass and hit the underside of the crossbar. Instances of a positive relationship between these two have appeared in the two previous games, but it was more obvious against Arsenal. Benteke can also be an outlet at throw ins. There are three players around Benteke as he receives the ball from a throw in. Numbers around the target player are important, Benteke can hold the ball and release quickly to his team mates. By the time Chambers has put Benteke under pressure, the ball has already been released to Can who is in a deep position to play a penetrating pass or keep possession of the ball. Not only does Benteke offer Liverpool, an option to play to his feet, he can also run in behind and take advantage of his pace. A player of these qualities is something Liverpool missed last season. Pictured below is an example of this method. Once again, the chance was created through the relationship between Coutinho and Benteke. The Arsenal defence are stepping up while Benteke is beginning his run in behind the back line. The timed back heel pass by Coutinho was met by Benteke with a positive touch forward, taking him further away with the chasing centre backs. As Benteke drops deep to receive the ball at feet, the closest support usually appears from either Coutinho or Firminho ( the wide players in Liverpool’s team). Benteke’s strength and power when holding the ball up for his team mates can be seen as a way to give more space for the inside forwards – Coutinho and Firminho. This is obvious from the screenshot above. Firminho has moved inside and Benteke flicks the ball back inside for Firminho to run onto leaving him with a large amount of space between the lines to exploit. The following image portrays the most support Benteke received within the game. One important thing with Benteke dropping deep to receive the ball is that it attracts a centre back with him – in this situation it is Chambers. The blue circle is where Benteke took Chambers from. In terms of exploiting this space, Coutinho should be making a direct run into the space as Benteke makes contact with the ball. If he kmocks the header down to Milner or Firminho, this space can still be exploited by Coutinho if he moves into this area at the appropriate time. Arsenal struggled to keep Benteke under control throughout the game, resulting in him being involved in many of Liverpool’s chances on goal. Having a suitable target man for your system allows midfield players to make direct runs in behind. Throughout the game, it became apparent that Liverpool were pushing midfield players forward by making timed runs into the box. Firminho is the player making the run from midfield in this situation within the game. Liverpool are aiming to exploit Arsenal’s high line here by having a positive pass played for a timed run by a midfield runner. A few seconds later Firminho fails to control the ball comfortably and the attack stalls. Although a chance wasn’t created this time, this midfield run caused the Arsenal defence to be put under pressure. Milner’s pass was weighted well for Firminho to meet with a timed run and if his touch as more clinical the run may have been more effective than it was. As Liverpool played with two inside forwards, when they moved inside with the ball there were many options for them to choose from for the attack to be effective. Coutinho has moved inside with the ball and no defender is putting him under pressure. Also circled is James Milner who is the player who completes the run from midfield. Benteke has had a key role in this phase of play, pulling the other centre back away from Chambers causing him to drop deeper. The space between the two centre halves has allowed Milner to run through it and get on the end of a perfectly timed through ball by Coutinho. Milner has met the through ball at the correct moment. However, his decision making within the box was particularly poor. He chose to cut the ball back to Benteke instead of shooting towards goal with his left foot. The cut back was a more difficult option. Although the ball was on his left foot, it’s a good angle to challenge the goalkeeper and hope for a goal. As previously mentioned, Arsenal aimed to play through the middle as quickly as possible. Liverpool failed to identify and track their runners into the box when it was being played forward or from wide areas. Although this image has been used previously, it relates to Liverpool’s defensive weakness. One reason Ramsey got into the box with no defender around him was Clyne not identifying him quick enough. As soon as Cazorla was about to receive the ball, Clyne should be looking around to identify if there are any attackers in his area. If he did, he would notice Ramsey starting to run into the box. However, the right back never checked his shoulder and didn’t notice the runner into the box. Luckily his goal was disallowed but it was poor defending by Liverpool. Arsenal were playing with a front three roaming system, with flexibility in the identity of the midfield runners. In the previous graphic, it was from the left side of the box by the right sided player in the three and in this one it is centrally by the left sided player of the front three. Giving Sanchez this amount of space is dangerous, especially in the box. Gomez (pictured furthest to the right) has done well to tuck inside, but he’s not tight enough to the Chilean forward. If the ball landed at the forward’s feet, Gomez would have allowed him to receive the ball in a dangerous amount on space in the box. If he was touch tight and the ball was over weighted like it was in this moment of the game the same outcome would have occurred. But, the young defender cannot afford to be this far away from one of the most deadliest strikers in the box whether the pass is timed perfectly or is over weighted. The way Arsenal were set up, Liverpool didn’t particularly deal well with the inside forwards and runners around their full backs. The roaming of the home side’s front three proved to be difficult for the visitors. Pictured above is a good example of this defensive vulnerability. Gomez has once again failed to realise Lucas has pressed Ozil. Accordingly, he plays a pass over the top of the left back. As he does this, Ramsey is making a direct run in the space vacated by the over pressing left back. As previously mentioned with Clyne, Gomez has to check his shoulder in this situation and he will identify the run by Ramsey. If not, then he will be free and will meet the ball like he does further on after this action in the game. Covering Gomez though, is Lovren, making the rest of the defensive line move across. Along with tracking runners going in behind, the full backs also have to contribute to those inside the ‘pockets’ to not receive the ball from a wide area. The above image is a prime example of this situation. Clyne’s body position is okay in order to show Sanchez outside, but he can also prevent the pass to Ozil in the ‘pocket’. The blue circle is where I think Clyne should position himself on the pitch. If he did, he would cause the ball to be played backwards, or if played forward Ozil doesn’t have a great amount of space to be effective when running in behind the defensive line anyway. Both teams contested a very tactical match. Liverpool earned their third clean sheet from three games whereas Arsenal failed to win once again at home. Both sets of fans may see the end result as the fairest possible due to both teams having moments of the game when they dominated and chances on both sides.